I’m not sure what to say about Elevation, or even how to categorize it. Is it horror? Not in the jump-scare, things-that-go-bump-in-the-night, monsters-eating-your-face sort of way. But does the idea of losing weight without losing size, and with a day you’ll weigh zero pounds looming, scare you? Then yes, you might call this horror. Or fantasy, in that I’m pretty sure there’s no such documented case of a person being perfectly healthy, losing weight, and causing anything he/she touches to have zero weight — sounds pretty fantastical to me. All that being said, my main take-away here is that Elevation is a truly excellent read — brief, spare, and finely crafted, with sharply defined characters, mounting tension, and an overall feeling of both well-being and loss permeating the entire story. Scott Carey is a likable guy stuck in a weird situation, who tries to make the best of things by doing his part to make a small difference in the lives of the people he cares for. And despite the short length of the story, it was plenty of time to get emotionally involved. Was that a lone tear making its way down my cheek as I read the last few pages? I’ll never tell. 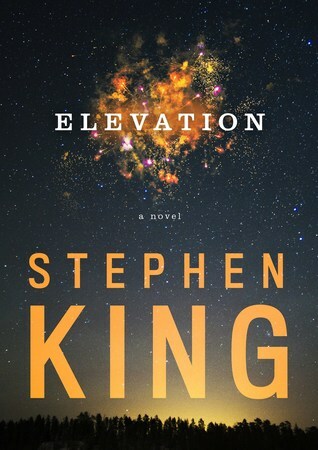 Beautifully written, Elevation is a quick, low-commitment read that will leave you feeling — dare I say it? — elevated. Assuming the mechanical and/or magical revolution has already taken place by the time you read this, we, the editors, always knew you would come out on top. Yes, you. We knew this day would come. We tried to warn the others. It was obvious either the sharp rate of our technological advancement would lead to the robot singularity claiming lordship over all, or that the fairies would finally grow tired of our reckless destruction of the natural world and take it back from us. 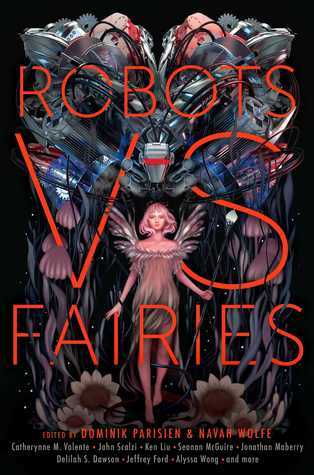 Robots vs Fairies is an anthology of stories by an impressive assortment of sci-fi and fantasy writers, each focusing on either robots or fairies (or in a few cases, both). There are eighteen stories in all, ranging from silly to darkly serious. In each case, right after the story, the author declares him/herself “team robot” or “team fairy”, and explains why — and these little pieces are just as entertaining as the stories themselves, in my humble opinion. As I’ve said in many a review, I’m really not a short story reader, so the fact that I made it all the way through this book is somewhat of an achievement. I did end up skipping 2 or 3 stories that just didn’t call to me, but otherwise read them all, even the ones that left me puzzled or disengaged or with a mighty shoulder shrug. Build Me a Wonderland by Seanan McGuire: Well, of course I loved the Seanan McGuire story! 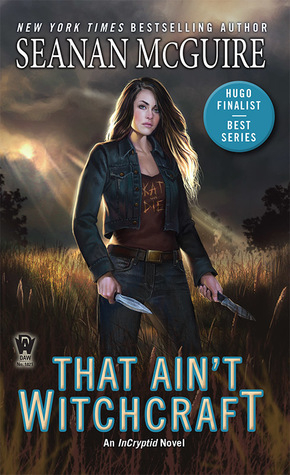 I’m been on a roll with Seanan McGuire books all year, so there’s really zero chance that I wouldn’t love what she wrote. In this story, we see behind the scenes at a theme park with really magical magical effects. Hint: They’re not CGI. The story is clever and intricate and very much fun. Quality Time by Ken Liu: Ooh, a disturbing robot story! All about a young tech worker looking for the next big breakthrough, whose inventions have unintended consequences. Murmured Under the Moon by Tim Pratt: About a human librarian given responsibility for fairy archives. Creative and magical and just a wee bit threatening — and hey, it’s about a library! What’s not to love? 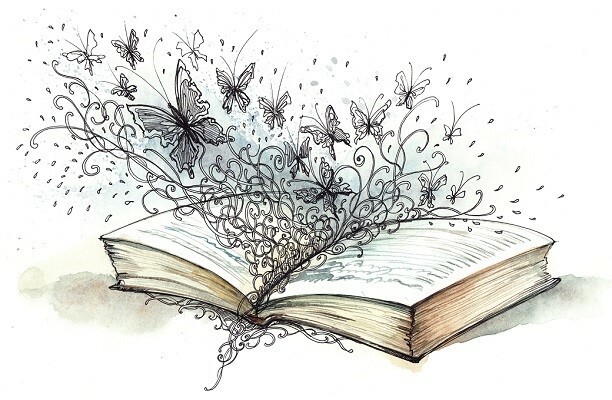 The Blue Fairy’s Manifesto by Annalee Newitz: Not a fairy story! It’s a robotic version of Pinocchio, and asks all sorts of great questions about what it is to be real, and what it means to have choices. Bread and Milk and Salt by Sarah Gailey: I loved Sarah Gailey’s American Hippo novellas, so was really excited to see her included in this collection. Bread and Milk and Salt is probably the creepiest story of the bunch, about a fairy captured by a sadistic human and how she turns things around. Dark and disturbing and delicious. Three Robots Experience Objects Left Behind From the Era of Humans For the First Time: Oh my. This story is exactly what the title says it is — a dialogue between robots trying to figure out the purpose and functionality of human objects such as a ball, a sandwich, and a cat. Just amazing. And in case you’re wondering about our future overlords, it would seem clear that it’s cats for the win. There are plenty more stories, some I found captivating, some weird, all original and entertaining and often perplexing too. It’s really a strong collection, and I could see enjoying it either as a book to read straight through, or as a collection to leave on the nightstand and pick up from time to time to read just one story here or or there, whenever the mood strikes. As a side note, I had purchased an earlier collection from these editors, featuring some of the same authors plus several others whose works I love. The Starlit Wood: New Fairy Tales was published in 2016, and I have yet to open it. Maybe it’s time for it to come down off the shelf and sit on my nightstand, close at hand for when I need a story or two. Before there was Mercy Thompson… In a world far removed from the Alpha and Omega werewolves… There was the shapeshifting mercenary Aralorn. I bought this book several years ago, after binge-reading the Mercy Thompson series. 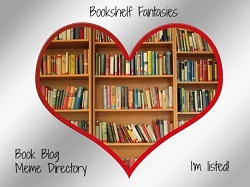 It’s so frustrating to binge on a favorite series… and then run out of books to read! I read all of the Mercy Thompson and Alpha & Omega books pretty much straight through, and then found myself at loose ends, wanting more. 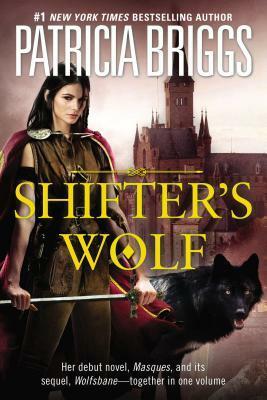 The two novels in Shifter’s Wolf are not connected to the world of the Mercy books, but when I realized that there were more Patricia Briggs books out there, I pounced. When Cat wakes she weaves stories around the Otherworld. Her books are labelled as fantasy, but Mynfel’s domain seems more real to her than the humdrum streets of the city. I have no idea where or when I picked this book up… but it’s been on my fantasy shelf for years. 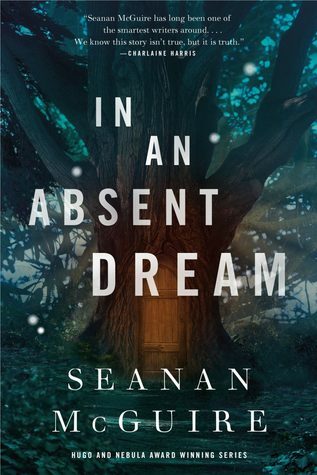 Maybe this is partially the influence of the Faerie world I’ve been inhabiting through other reading lately, but I love the sound of the plot, especially the idea of a fantasy writer who actually dwells in an Otherworld in her dreams. I’ve been wanting to read more by Charles de Lint (so far, I’ve only read The Mystery of Grace, which was amazing). 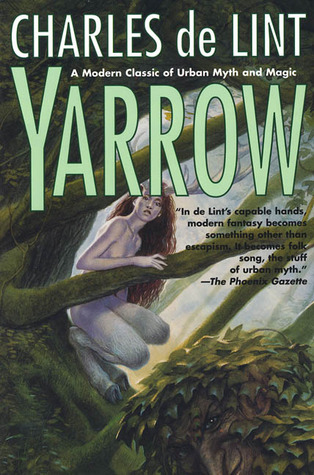 His Newford series has so many books that I keep hesitating to dip my toes in, but Yarrow is supposed to be a stand-alone, so it could be a great choice. 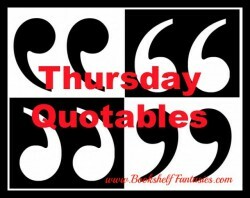 Have you read any of this author’s works? Any you particularly recommend? 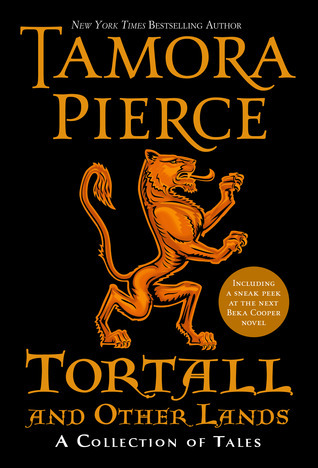 Welcome back to the wonderful world first introduced in the amazing trilogy, His Dark Materials (which I recently wrote about, here). After 17 long years, Philip Pullman takes us back to the alternate reality of an Oxford, England in which the church is in control, people are accompanied by animal-shaped daemons who are really a part of them, like a visible soul that they can converse with, witches are real, and a strange particle known as Dust has everyone in a tizzy. La Belle Sauvage, the first book in Pullman’s new trilogy (The Book of Dust), is a prequel to the events of The Golden Compass and the rest. Anyone who’s read His Dark Materials knows (and loves) Lyra, the preteen heroine who’s brave and clever and ultimately responsible for saving the world. 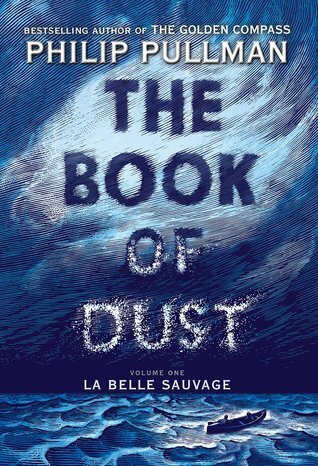 In La Belle Sauvage, Lyra is a baby — a helpless character, but still very much at the center of the action. The main character here is a boy named Malcolm, an innkeeper’s son with a heart of gold. Malcolm is a smart, inquisitive boy with the mind of a potential scholar, even though he’s probably destined to run the inn when he’s grown. Malcolm works hard at the inn, serving customers and helping his parents, and in his spare time also does whatever odd jobs are needed by the nuns of the Godstow Priory across the river. And when Malcolm has any time left over, he takes his canoe, La Belle Sauvage, out on the rivers and canals to explore and see all there is to see. When the nuns take in baby Lyra and offer her sanctuary, Malcolm becomes her instant protector, madly in love with the adorable baby and her equally adorable baby daemon. But the Consistorial Court of Discipline (CCD) is out to get Lyra, along with a deranged former scholar with a criminal past, and Malcolm comes to believe that only he can keep her safe and get her to her father, Lord Asriel, for protection. When a huge storm unleashes massive flooding, Malcolm and Alice, a girl who works at the inn as well, rescue Lyra from the waters engulfing the priory and set off in the canoe, with all sorts of dangerous foes determined to catch them and take Lyra away, no matter what it takes. Oh my, is this a good book! The adventure is top-notch. We have spies galore, and Malcolm first becomes involved when he inadvertently witnesses the capture of a member of the anti-Church spy ring by agents of the CCD. We also see the creeping terror as the Church’s iron-fisted rule takes over school and society, as school children are encouraged to join a religious league and inform on their parents, friends, neighbors, and teachers — anyone who steps away from the approved teachings of the Church or dares to break the increasingly harsh rules imposed by the CCD. Malcolm is a terrific main character. He’s smart and daring, always looking to learn, but loyal to his parents and the nuns, and not afraid of working hard. He’s kind and patient, but ready to step up and be fierce when needed. He and Alice start off as enemies, but as they flee with Lyra, they become allies and then true friends. Lyra, of course, is adorable. She doesn’t do much, but all the action swirls around her. It’s fascinating to see an infant in this world — something we never see in the original trilogy. What we learn in The Book of Dust is that babies have baby daemons, who are also rather helpless and cute and dependent on others for care. Lyra’s daemon Pan takes the form of various small animals — among them kittens and chicks — and curls up to nap with Lyra, each giving comfort to the other. Lyra and Pan babble together in their own language, and somehow it’s just amazing to see how Pullman plays out the concept of daemons in the context of early childhood development. I wondered how Pantalaimon got his name — I’d assumed while reading The Golden Compass that the person must name his or her daemon, but in La Belle Sauvage, one of the nuns tells Malcolm what Lyra’s daemon’s name is. So is the daemon named by the parent at the same time as the child? I guess it must be so, since the daemon has a name before the child can talk, but it struck me as surprising — I kind of expected the naming of the daemons to have something to do with the person’s inner truth, or some such thing, rather than to be imposed from an external source. This is something I’d definitely like to know more about! There are some cool connections to the world of His Dark Materials. I thought Malcolm’s name was familiar… and with good reason. In the novella Lyra’s Oxford, which takes place a couple of years after The Amber Spyglass, Lyra encounters a Professor Polstead, who is described as “stout, ginger-haired, affable; more inclined to be friendly to Lyra than she was to return the feeling.” It’s Malcolm! I’m so happy to know that he’s still a part of Lyra’s life later on, even though she doesn’t know his significance or how he saved her life. I hope we’ll learn more in later books in The Book of Dust. Other familiar faces are (of course) Lord Asriel and Mrs. Coulter, Lyra’s parents, as well as the gyptian Farder Coram and the scholar Hannah Relf. I absolutely loved the world-building in La Belle Sauvage. Even though this world is familiar from the earlier trilogy, we get to see aspects of the society that are new, through new and different sets of eyes. As I mentioned, the characters are phenomenal, especially Malcolm, but even the more minor characters are distinctive and memorable. The action is thrilling, especially once the flood comes and Malcolm and Alice begin their adventure on the river. The two show amazing courage and stamina, sacrificing everything for the sake of little Lyra. Their experiences are often truly terrifying, but their essential goodness and bravery keeps them going even when it seems like they’ll never reach safety. The author never talks down to his audience, and as in the original trilogy, brain power is required. There’s talk of physics and theology and particles and matter, and scholars are among the most esteemed characters. Philip Pullman’s characters value intelligence and curiosity, and reading his books is anything but a mindless pursuit. The ideas and concepts here demand that the reader put some effort in — all well worth it. Ah, such a good read! Really, what more can I say? 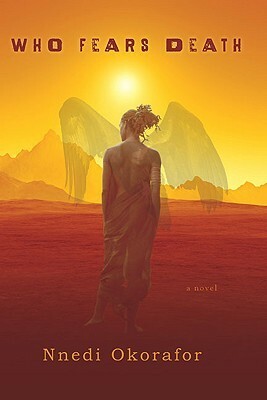 I cannot wait to continue the trilogy, and will be eagerly stalking The Book of Dust‘s Goodreads page for the first hint of a publication date for the second book (which, according to Goodreads, will be called The Secret Commonwealth). If you read His Dark Materials, you simply must read La Belle Sauvage. And it probably goes without saying, but for anyone who hasn’t read the first trilogy, go do it now! Get thee to a bookstore or library and grab a copy of The Golden Compass! It’ll rock your world. 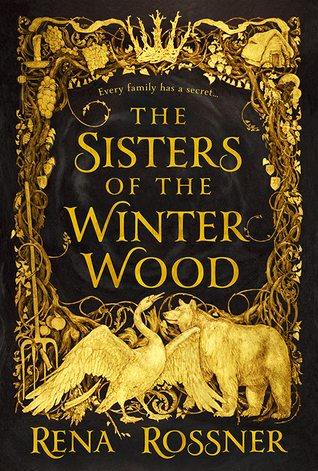 One final note: The book is marketed as young adult fantasy and is published by the children’s division of the publisher, but as with His Dark Materials, I have a hard time defining this book by its intended audience. It’s a great book, period. For anyone. And for anyone who cares about such things, I’d say the tone here is skewed slightly older, as there are hints of more adult content in the context of the actions of a terrible villain, and there’s even an f-bomb, which I don’t believe occurs at all in His Dark Materials. Regardless, La Belle Sauvage is beautifully written and is another excellent chapter in an exciting series of fantasy novels — and should be read by adults and smart kids of all ages!